The Ford Motor Company (commonly referred to simply as "Ford") is an American multinational automaker headquartered in Dearborn, Michigan, a suburb of Detroit. It was founded by Henry Ford and incorporated on June 16, 1903. The company sells automobiles and commercial vehicles under the Ford brand and most luxury cars under the Lincoln brand. Ford also owns Brazilian SUV manufacturer, Troller, and Australian performance car manufacturer FPV. In the past, it has also produced tractors and automotive components. Ford owns an 8% stake in Aston Martin of the United Kingdom, and a 49% stake in Jiangling of China. It also has a number of joint-ventures, one in China (Changan Ford), one in Taiwan (Ford Lio Ho), one in Thailand (AutoAlliance Thailand), one in Turkey (Ford Otosan), and one in Russia (Ford Sollers). It is listed on the New York Stock Exchange and is controlled by the Ford family, although they have minority ownership (but majority of the voting power). Ford introduced methods for large-scale manufacturing of cars and large-scale management of an industrial workforce using elaborately engineered manufacturing sequences typified by moving assembly lines; by 1914, these methods were known around the world as Fordism. Ford's former UK subsidiaries Jaguar and Land Rover, acquired in 1989 and 2000 respectively, were sold to Tata Motors in March 2008. Ford owned the Swedish automaker Volvo from 1999 to 2010. In 2011, Ford discontinued the Mercury brand, under which it had marketed entry-level luxury cars in the United States, Canada, Mexico, and the Middle East since 1938. During the financial crisis at the beginning of the 21st century, it was close to bankruptcy, but it has since returned to profitability. Ford is the second-largest U.S.-based automaker (preceded by General Motors) and the fifth-largest in the world (behind Toyota, VW, Hyundai-Kia and General Motors) based on 2015 vehicle production. At the end of 2010, Ford was the fifth largest automaker in Europe. Ford is the eighth-ranked overall American-based company in the 2010 Fortune 500 list, based on global revenues in 2009 of $118.3 billion. In 2008, Ford produced 5.532 million automobiles and employed about 213,000 employees at around 90 plants and facilities worldwide. The company went public in 1956 but the Ford family, through special Class B shares, still retain 40 percent voting rights. Licensed under Creative Commons Attribution 3.0 (Dave Parker). 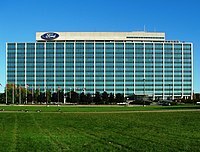 The Ford Motor Company (commonly referred to simply as "Ford") is an American multinational automaker headquartered in Dearborn, Michigan, a suburb of Detroit. It was founded by Henry Ford and incorporated on June 16, 1903. The company sells automobiles and commercial vehicles under the Ford brand and most luxury cars under the Lincoln brand. Ford also owns Brazilian SUV manufacturer, Troller, and Australian performance car manufacturer FPV. In the past, it has also produced tractors and automotive components. Ford owns an 8% stake in Aston Martin of the United Kingdom, and a 49% stake in Jiangling of China. It also has a number of joint-ventures, one in China (Changan Ford), one in Taiwan (Ford Lio Ho), one in Thailand (AutoAlliance Thailand), one in Turkey (Ford Otosan), and one in Russia (Ford Sollers). It is listed on the New York Stock Exchange and is controlled by the Ford family, although they have minority ownership (but majority of the voting power). During congressional hearings held in November 2008 at Washington D.C., and in a show of support, Ford's Alan Mulally stated that "We at Ford are hopeful that we have enough liquidity. But we also must prepare ourselves for the prospect of further deteriorating economic conditions". Mulally went on to state that "The collapse of one of our competitors would have a severe impact on Ford" and that Ford Motor Company's supports both Chrysler and General Motors in their search for government bridge loans in the face of conditions caused by the 2008 financial crisis. Together, the three companies presented action plans for the sustainability of the industry. Mulally stated that "In addition to our plan, we are also here today to request support for the industry. In the near-term, Ford does not require access to a government bridge loan. However, we request a credit line of $9 billion as a critical backstop or safeguard against worsening conditions as we drive transformational change in our company"  GM and Chrysler received government loans and financing through T.A.R.P. legislation funding provisions. On November 1, 2012, Ford announced that CEO Alan Mulally will stay with the company until 2014. Ford also named Mark Fields, the president of operations in Americas, as its new chief operating officer  Ford's CEO Mulally was paid a compensation of over $174 million in his previous seven years at Ford since 2006. The generous amount has been a sore point for some workers of the company. In May 2017, Ford announced cuts to its global workforce amid efforts to address the company's declining share price and to improve profits. The company is targeting $3 billion in cost reduction and a nearly 10% reduction in the salaried workforce in Asia and North America this year to enhance earnings in 2018. Jim Hackett was announced to replace Mark Fields as CEO of Ford Motor. Mr. Hackett most recently oversaw the formation of Ford Smart Mobility, a unit responsible for experimenting with car-sharing programs, self-driving ventures and other programs aimed at helping the 114-year-old auto maker better compete with Uber Technologies Inc., Alphabet Inc. and other tech giants looking to edge in on the auto industry. In 1987, Ford of Brazil and Ford of Argentina merged their operations with the Brazilian and Argentine operations of Volkswagen Group, forming a new joint-venture company called Autolatina with a shared model range. Sales figures and profitability were disappointing, and Autolatina was dissolved in 1995. With the advent of Mercosur, the regional common market, Ford was finally able to rationalize its product line-ups in those countries. Consequently, the Ford Fiesta and Ford EcoSport are built only in Brazil, and the Ford Focus only built in Argentina, with each plant exporting in large volumes to the neighboring countries. Models like the Ford Mondeo from Europe could now be imported completely built up. Ford of Brazil produces a pick-up truck version of the Fiesta, the Courier, which is also produced in South Africa as the Ford Bantam in right hand drive versions. In October 2017, Ford announced its Team Edison battery-electric vehicle group to lead the company's renewed efforts into the EV market, in which it currently offers only the Focus subcompact and has plans for a small 300-mile SUV by 2020.. The new team will be headquartered in Detroit and have offices in Europe and Asia.